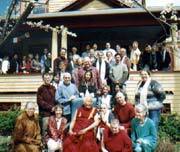 Kurukulla Center for Tibetan Buddhist Studies, Inc. was founded in 1989 under the spiritual direction of Lama Zopa Rinpoche and the FPMT. Under the guidance of resident teacher Geshe Ngawang Tenley, Kurukulla Center's mission is to provide a community of support for those who are studying and practicing the Tibetan Buddhist tradition. Kurukulla Center was incorporated in the state of Massachusetts in 1990, and qualifies as a tax exempt not-for-profit corporation under section 501(c)(3) of the Internal Revenue Code. Kurukulla Center is affiliated with the Foundation for the Preservation of the Mahayana Tradition (FPMT), a worldwide network of over one hundred and twenty Tibetan Buddhist centers, healing and retreat centers, monasteries, nunneries, publishing houses, and related activities. The FPMT was founded in 1975 by Lama Thubten Yeshe, one of the first lamas to bring Tibetan Buddhism to the West, and continues today under the direction of his heart disciple, Lama Zopa Rinpoche, and with the inspiration of His Holiness the Dalai Lama. To find out more about the growth of the center over the last 14 years see Center History and Building Fund.